If there are antidotes to Charlottesville, one may be "Step," the new documentary from Amanda Lipitz that won the U.S. Documentary Special Jury Award for Inspirational Filmmaking at the 2017 Sundance Film Festival and the Audience Award for Best Feature at the 2017 AFI Docs festival. The film tells the remarkable story of the step team at the Baltimore Leadership School for Young Women (BLSYW). The school opened its doors to sixth graders in 2009. In the spring of 2016, its inaugural class was preparing to graduate. Paula Dofat, Blessin Giraldo, Cori Grainger as The Lethal Ladies. "Step" follows three young women as they train on the step team, known as the Lethal Ladies, with the goal of winning an extramural competition, and as they pursue their academic studies with the goal of securing college acceptance. The former objective is led by dedicated coaches, the latter by the stalwart support of the Upper School Principal and the commitment of one of the school's counselors, Paula Dofat. 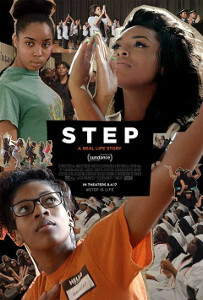 "Step" focuses on Blessin Giraldo, whose mother suffers almost crippling depression; Cori Grainger, the class valedictorian whose mother has recently remarried; and Tayla Solomon, who struggles with her grades even as her demanding corrections officer mother acts not only as her daughter's booster, but the entire step teams'. All of the girls' parents appear to be genuinely loving, but in the face of students whose academic struggles are exacerbated by precarious economic circumstances, the complexities of the college applications process, and the seemingly insurmountable challenge of financial aid, it is the school's principal, coaches, and counselors who emerge as the heroes of the story. Their indefatigable efforts on the girls' behalf can seem herculean at times. They refuse excuses and self-pity yet show unlimited depths of compassion and tough love to see their charges through to BLSYW's mission: that each and every graduate will win college admission, a goal this inaugural BLSYW graduating class has attained. A commencement speaker reminds them that this achievement is not shared by most schools in the United States. Blessin, despite being the step team's original organizer, is the most challenged by the demands of discipline, both on the team and in the classroom. Ms. Dofat, speaking to admissions representatives from a bridge school program on Blessin's behalf, becomes visibly emotional and apologizes. "I'm sorry," she says wiping away tears. "This is so unprofessional." One can't blame her – so much of her professional life and emotional being are wrapped up in the lives and potential of the girls. "Step" could be faulted for coming off as a feel-good documentary, but there is always an open spot in my heart for documentaries and based-on-a-true-story accounts about the power of education and the arts to shape young people for the good. Indeed, as a life-long educator, it has been my experience that when we raise the bar and demand excellence, not all but most young people rise to the challenge. In "The Great Debaters" (2007) Denzel Washington resurrected the story of Melvin B. Tolson who led the debate team of the historically black Wiley College to victory in the 1930s. Katie Dellamoggiore's 2012 "Brooklyn Castle" trained its lens on Intermediate School 318, an inner-city public school in Brooklyn, New York, where an after-school chess program produced the top junior high school chess team in the country and the first middle school team to win the United States Chess Federation's national high school championship. Two 2015 films focused on schools with predominantly Latino students. For champions of the STEM (science, technology, engineering, math) model that is being so forcefully advanced these days, Sean McNamara's uplifting "Spare Parts" is a dramatic film based on Oscar Vasquez, the Carl Hayden High School teacher who steered the engineering club in Phoenix, Arizona, to win first place over M.I.T. in the 2004 Marine Advanced Technology Education Center remotely operated vehicle competition. For champions of sport, Niki Caro's "McFarland, USA" is also a dramatic film based on McFarland High School Coach Jim White and the Latino cross country team he created from scratch and trained to win the 1987 California state championship. My favorites are documentaries that focus on the arts, like "Step" and Amy Sewell's 2005 "Mad Hot Ballroom" about a ballroom dance program in the New York City public school system for fifth graders in the Tribeca, Bensonhurst and Washington Heights neighborhoods that culminates in a city-wide competition. The Baltimore Leadership School was established in partnership with Baltimore City Public Schools, and all of these examples demonstrate the equalizing – and transformative – effects public education can have when its possibilities are embraced by bold teachers and students committed to something larger than themselves. As we face the demolition of public education in the United States, films like these are powerful reminders of what it is we are in the process of giving up.